there is no difference between the inside and the outside of the ring. This is an example of the creator which created everything from himself. As seen in the explanation of the Tree Of Life pendant man perceives reality in a dualistic manner, good and evil, reality that does not recognize the one force behind existence. Now, take scissors and cut the first band in the middle -instead of two rings you will end up with one larger ring. This shows the idea of duality-when you perceive the One through the dual perception you get the illusion. Cut about a 1/3 from the width of the other ring. 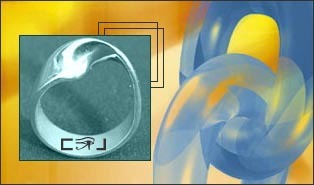 You will then end up with two rings, a big one and a small one -one inside the other. To understand the meaning of this we first check the Hebrew names of god. The Jewish tradition prohibits the pronunciation of the name of God .However the names of the Creator (as they appear in the Hebrew Bible) are not names at all but only symbols which lead to truths. The first Hebrew name for God is "EL" which means "into"-a definition of direction without a particular goal (since the creator is everything and everywhere). The numerological value of the first letter in the word "EL" is 1 and the second letter has the numerological value of 3- the idea of the one who is three, the holy trinity as in the Mobius ring when cut to 1/3 you get the bigger ring, the macro, the Creator; and the smaller ring ,the creatures, the living beings and the relation between them -creation. "ELOHIM" is another Hebrew name for God- is it really a name? Taking the word apart (in Hebrew) you get three words- "EL"-God in a male aspect, "ELA" -God in a female aspect (Goddess) and "ELIM" meaning gods, once again we have the holy trinity -male, female and plural. Even the Hebrew name "Yehova" contains the words "haya"-was, "hove"-is and "yeeheeye" meaning will be-the cycle of time. "EMET"-the Hebrew word for truth is made from the first letter in the Hebrew alphabet, the letter "Alef" ,the middle letter which is "Mem" and the last letter which is "Tath". When we realize who we truly are, the cosmic joke will reveal itself. The One will make the folly of war, fear and hatred evident to all of us- Because separation is the GRAND ILLUSION of it all.